Keep your myograph system in top shape to ensure optimal performance. 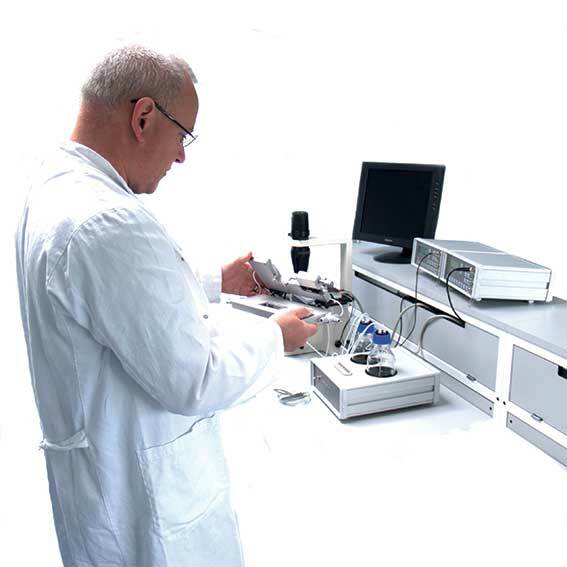 It is recommended to have a myograph system serviced every 1-2 years depending on usage. System dismantle, part cleaning, assembly, lubrication temperature re-compensation of transducers, calibration, functional system test, documentation. This system was custom-made for molecular studies that focus on the contractile proteins and force development signal transduction research. Key features of this custom-made system are very low volume baths for skinning or permeabilizing small muscle preparations and moving them smoothlybetween different cell internal solutions that mimic intracellular environments. ​The system wasmade for and in collaboration with the laboratory of Prof. Avril Somlyo, University of Virginia, USA. This custom-made system is for skeletal muscle fibers and used in the study Phenol increases intracellular [Ca2+] during twitch contractions in intactXenopus skeletal myofibers. ​The system were developed for Dr. M. C. Hogan, University of California, USA.